Don Smith (California, United States) on 23 December 2013 in Landscape & Rural. 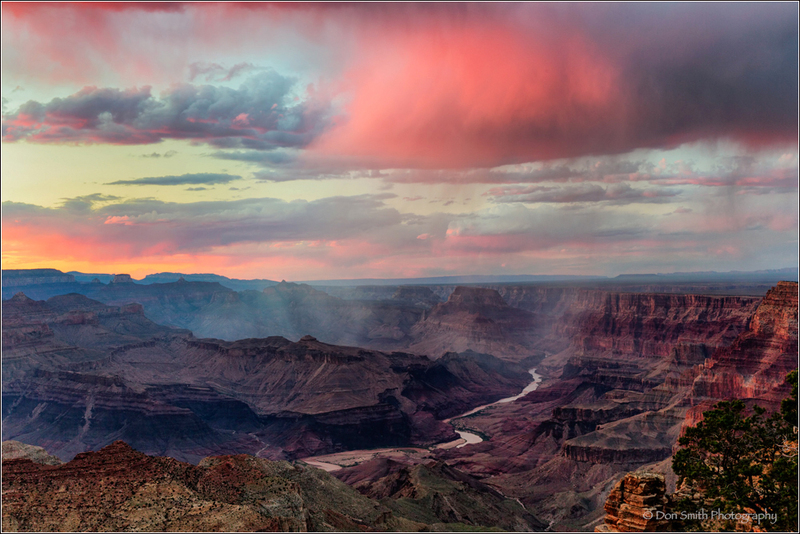 Image #9 of my 12 Favorites of 2013 was captured along the south rim of the Grand Canyon during monsoon season. For more on the story, please click here: My Favorite 12 Images Of 2013. A rain squall had been moving up the Canyon as the sun was dropping towards the horizon. As the sun nestled onto the horizon, the storm clouds caught color and a band of rain illuminated just west of the twisting Colorado River. The scene reminded me of a painting out of the old west! with beautiful composition, clouds, colors & lighting! Fantastic view. Gorgeous light and color! stunning work as expected . . .